Thank you for your interest in contributing to the Museum of Material Memory. Please read through the Instructions and Terms and Conditions carefully before submitting your memories. Content may not be redistributed, copied or sold in any form of media without express written consent from the copyright holders and the Museum of Material Memory. Unauthorized use of any content from this site without permission will result in legal action. We do not charge a fee to publish your contributions. By contributing to this project, you are agreeing to your content being used in publications, exhibitions, articles and presentations for the purposes of promoting the project in any existing and future media with proper copyrights and credits. All submissions, including the images and text, are edited and proofread before being published. If the object belongs to you, then it must be in your family since two generations or over. If it belongs to a friend, relative or acquaintance, and you wish to archive its history due to your associative memory/connection to it, then please be sure to provide ample detail for the story. 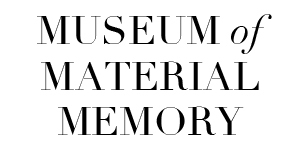 Museum of Material Memory does not own any rights to the images and the text for licensing or sale purposes. Please provide clear and concise captions with the photographs of your object. We accept submissions from anywhere in the world as long as the objects originated in the Indian subcontinent. If you are having trouble compiling your memory, please drop an email to us at [email protected] with a photograph of the object. We are happy to organise a conversation or a house visit as relevant.